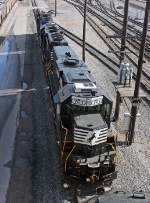 Description: A scruffy looking engine on NS LY-19 heads away from view and back to Buckeye yard. Here it crosses the CSX Scottslawn Secondary diamond at CP Mounds. Description: A rusting ex-Conrail GP38-2 and a repainted ex-Conrail SD50 pull NS P61 through the plant at Church Street. The train on the eastbound main, with NS 8796 leading, has tied down due to a derailment in the yard at Linwood earlier in the afternoon. Description: 5318, in all it's former Conrail glory, sits outside Fisher body. Description: Just looks cold..doesn't it? Description: The NS 3008 and the NS 5318 were running cab light on the Redkey Running Track. Description: This ex-Conrail unit has seen better days. Description: Still working on night photography.